When I was in elementary school, I did my science project on optical illusions. You know the one with the picture of the old lady with the big nose that is also a picture of the young lady looking to the side? And the little gray dots that appear in between the black and white squares? Ooooo, I loved those. I’d spend hours staring at them and marvelling at the moment when I could finally see the trick within. 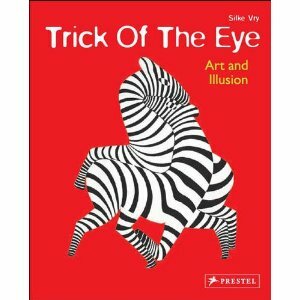 Well, imagine my delight while visiting the Getty Museum at finding Silke Vry’s Trick of the Eye: Art and Illusion. It’s one of the best books on optical illusions I’ve seen since it marries both the ubiquitous illusions, a la “is it two faces or a vase?” with real-life illusions in fine art. From the mirror in van Eyck’s “The Arnolfini Portrai” to those darn stairs from MC Escher, Vry’s book is a gorgeous way for children to see, or not see, illusions in art and design.